They flew over from England. They are very tiny. Now is the time to plant them. The Tuberous Begonia seeds from Blackmore and Langdon’s were so successful last year that we acquired more varieties this year. They were a bit slow blooming last year so we are starting them a month or more earlier this year. 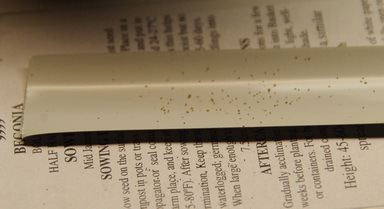 That little bit of brown dust that you can see on the white plastic label is the tiny seed. They will get sown, very carefully, on a bed of fine sterile media. I will fill the seedling tray with that media and then sift a handful of it through the Assistant Gardener’s baking sieve. That will leave me with a very smooth surface that will receive the seeds. Trying to distribute them evenly is a bit of a challenge. Obviously, once they hit the surface they become invisible so I just have to trust in my steady hand to get them coming off that label in an even pattern. The soil is sifted to make a fine surface so that the seeds don’t fall in between the larger particles of the unsifted soil. If you are that tiny a seed it’s a long way to grow back up from even a 1 cm cavity. 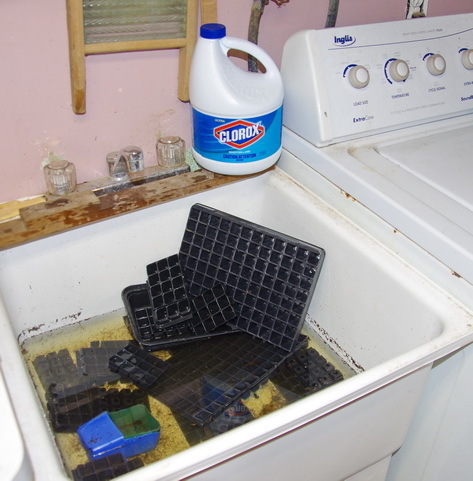 The trays, once seeded, will be put in a water bath to become thoroughly soaked. They are never overhead watered because even the finest spray would float and move the seed. It’s all rather easier than it sounds and I find the success rate quite high. When germinating and growing on, any seed, cleanliness is very important. There is a host of fungi and other nefarious organisms that would love to lunch on your seedlings. All of my seed starting equipment goes into the laundry sink with some warm water and a good shot of bleach. With a little effort, all traces of last year’s soil can be removed and the bleach will, hopefully, take care of any lingering fungal spores. Rinsed clean and allowed to air dry they are ready to start this year’s seeds. The soilless mix that you should purchase for starting seeds is already sterile and requires no further treatment. I keep this planting media in a clean metal garbage tin with a lid that keeps out most of the strange things floating around the basement. How do I sort and file all of the seed packets that come through the door at this time of year? Alphabetical sounds like a normal system but it is not logical to a gardener. My little filing cabinet has zip lock bags that are filed in date order. When the seeds arrive they are sorted into piles depending on their sowing dates. There are two sets of dates, one for seeds that are sown indoors and one for seeds sown directly into the garden. 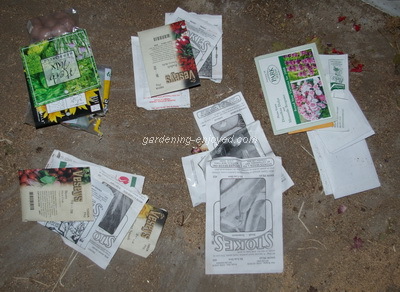 Having sorted and filed them when they arrive, I just have to go to the basement each week, open the file box and pick out that week’s seeds and get busy planting. Simple but very effective. Dorothy Asks? I, too, have a "grow op" of geraniums (and other plants) under lights in my basement. My question: I think it is impossible to have too many geraniums, but I have trouble rooting them. I've tried rooting them in water, rooting them in damp soil, rooting them in sand, dipping them in rooting compound, not dipping them. My success rate is about 50%. Is there a better way? Elizabeth Asks? Well, this new growing system you have been trying out looks quite the ticket (especially as I moved from my 3/4 acre garden and heritage house to a rental place with a big deck in the summer . My question is --there are two ways of buying this--the first is $32 and the second is about $62. Which did you use? If one uses ones own non soil earth(not theirs) what should one buy? I have always gardened organically---what kind of fertilizer did you use? What is really great about this system methinks is that one can go away for a few days after topping up the water and it might survive, no? Last question---did you wait until seed that you had started indoors were small plants before planting them in these pots, for instance in May? Did you plant seeds in any of them? Ken Answers! Do not buy their soil, there's nothing wrong with it, it's too expensive to ship. Your garden center will have a perfectly good soilless mix that you can use. There is also an option to have casters if you think you might want to move it during the season. They send you enough fertilizer for the first year which works well but it is not an organic fertilizer. I buy the $32 one as the boxes are identical. The $62 includes soil, the casters and the fertilizer and that's the only difference. The shipping on the $62 version is much higher because of the weight and volume. I have, so far, always used transplants but I think I will try some short season crops like beans, from seed this year. Later in the summer when there is considerable growth, the length of time between water fill ups gets noticeably shorter. If you are thinking of buying more than one, check the shipping costs. For some strange reason the shipping costs on five were much less then on 3 or 4. Susann Asks? Hi Ken! New Years wishes to you and yours! I've finally got a Amaryllis that I love and want to save. Of course I've seen instructions in lots of magazines and email newsletters but can't find them now! Ken Answers! Just follow the link to my website's Amaryllis page and that should solve your problem.